I’ve always been fascinated by the Civil War era. It probably had something to do with my first watching the TV series North and South. 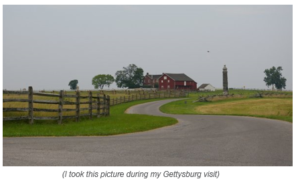 The costumes, beauty, characters, stories, and family dynamics pretty much had me hooked and I knew then that on my bucket list was to visit Gettysburg in PA.
And I did visit it and it was one of the most moving places I’ve ever been to. There was just something powerful about it. So of course when I came across an article about a law passed to protect the Union army during the Civil War, being the same law that federal officials today used to collect billions of dollars in corporate fines this year, I perked up. Much like our two World Wars in more recent years, armies would rely on contractors for the necessities like the uniforms, shoes and socks, horses, and more importantly, gun power. And much like what does still exist today, sometimes contractors would cut corners, producing less than standard products, or cutting back on supplies, while still receiving their pay. During the Civil War, soldiers would complain about their uniforms being made so poorly they’d dissolve in the rain. As well, they’d be handed over reigns that were attached to withered, starving, weak, and in some cases blind, horses, and expected to head into battle with these poor creatures that were ready to crumble on the spot. And shockingly, or perhaps not really, some contractors mixed sawdust with gunpowder… I’d argue this was in an effort to either save on supplies while still getting paid, or, more covertly, the contactors were really on the Confederate side and wanted to hinder the Union boys… needless to say, firing of a gun with sawdust probably won’t have the same affect as actual gun powder! At the time, the government didn’t have much in the way of funds and therefore, didn’t have enough money to employ inspectors to weed out the frauds. But Congress had a clever plan – it would provide an incentive for employees of these contractors to blow the whistle on their own companies. If any fines were collected, these whistleblowers would receive half of the money collected. Introducing your 19th Century whistleblowers. This clever law faded into the background after the Civil War ended and pretty much forgotten. Until the 1980s. This is when stories about military spending surfaced – $400 hammers and $600 toilet seats. The False Claims Act, enacted in 1863, got whistleblowers in the defence industry to come forward. And today, it works well with other industries too. The Act was first designed for much smaller companies. Back then fines could bankrupt a company. But today, with the mega millions in fines that organizations pay out, it’s the shareholders who foot the bill and nobody is held personally responsible. But many of these fines can be prevented with proactive measures. It’s the employees who are the first to see potential wrongdoing – so let them tell you about it in an anonymous, safe place, and save paying out the mega fines. Just imagine how an organization could invest the money that would potentially be lost to fines, if an ethics reporting system was put in place and employees could report on the first signs of fraud. A hotline where employees can come forward anonymously to report any wrongdoing or perceived fraud can give organizations early disclosure on issues and concerns that can be investigated and remedied before the media comes knocking at the door. Investigate all complaints to determine whether they warrant further investigation or not. Guard against retaliation and ensure employees feel confident that they will be supported for raising concerns about workplace misconduct and not end up in trouble for doing the right thing. Promote your whistleblower program by training employees regularly, provide personal materials they can keep with them to reference anytime they need to blow the whistle.